Precise mechanical movement and well engineered electronics have always been hallmarks of Sutter Instrument products. Over twenty years ago, our entrance into the optical products market capitalized on these attributes when we set out to produce a reliable, fast, electronically quiet, computer controlled filter wheel. The result was the Lambda 10, which met all of our original performance goals, and proved itself as a very rugged and reliable instrument. The success of the Lambda 10 led to the development of a new generation of wavelength switching products, and one of the widest ranges of accessories in the industry. Our current design, the Lambda 10-3 controller, allows for the use of three filter wheels without the expense of additional controllers. The Lambda 10-B has also been added as a lower cost alternative for those who do not require all the features of the Lambda 10-3. Both of these controllers can be coupled to our original filter wheel, as well as our latest line of wheels which have been designed for 25mm as well as larger diameter filters. Taking advantage of the latest in thin-film filter technology, Sutter has incorporated tunable filters into a single and 5-position filter changer, the Lambda VF-1 and Lambda VF-5, providing access to any center bandpass from 338 to 900 nm in nanometer increments. When the Lambda 10 was first introduced, most imaging systems could not keep up with its 55 msec switching time. As technology has advanced in the field of imaging, demand has increased for faster wavelength switching speed. Sutter Instrument has responded with the Lambda DG-4 PLUS , an integrated illumination system capable of switching wavelengths in less than 0.5msec. As demands for higher throughput and lower exposure times have increased, the need for a stand-alone high power light source was met with the Lambda LS. This integrated 175 (or 300) Watt xenon arc lamp, cold mirror, and power supply system is available in an efficient single cabinet design. Our lamp product family was recently expanded with the Lambda XL, which uses electrodeless bulb technology to produce a highly stable, long lifetime light source. 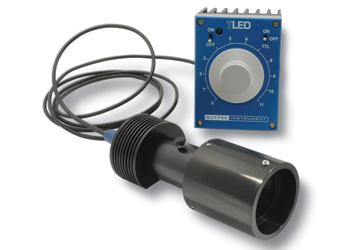 Now the TLED and HPX LED light sources represent the latest generation of solid-state microscope illumination. Sutter Instrument developed and designed the SmartShutter® to address the need for a robust and reliable shutter to serve as a component in our imaging line or as a stand-alone solution for optical applications. The SmartShutter® offers the most sophisticated shutter control available. Microprocessor control of the stepper-motor allows the user to optimize movement for speed or smoothness, produce a variable aperture, and achieve open/close times of 8 msec from trigger. The SmartShutter® is compatible with the Lambda 10-3, Lambda 10-B/IQ, and Lambda SC controllers. Customization of our optical product line for unique applications has become a specialty for Sutter Instrument. New technology has been incorporated in various custom and OEM filterwheels. For example, for systems using a large number of filter wheels, Sutter Instrument developed an RS-485 serial bus to allow up to 16 controllers to share a single serial port on a host computer. Sutter Instrument has also developed sensor and motor technology for a system of filter wheels running at liquid helium temperatures for use with astronomical telescopes. Please contact us directly for more information about custom filter changing devices.